Another IPCC report is out and indicators are that we still know what we knew. Humans are a tough and adaptable species. People live on the equator and in the Arctic, in the desert and in the rainforest. We survived the ice ages with primitive technologies. The idea that climate change poses an existential threat to humankind is laughable. Climate change will have consequences, of course. Since different plants and animals thrive in different climates, it will affect natural ecosystems and agriculture. Warmer and wetter weather will advance the spread of tropical diseases. Seas will rise, putting pressure on all that lives on the coast. These impacts sound alarming but they need to be put in perspective before we draw conclusions about policy. ...Cutting emissions is not the only way to reduce the impacts of climate change. Adaptation and development are alternatives. But these trade-offs are rarely discussed. More than 15 per cent of all development aid is now spent on attempts to prevent climate change. Is that the best way to help the intended beneficiaries? Or does it reflect the donors’ priorities? None of this is to say that climate change is not a problem that needs to be solved. We cannot let the planet grow warmer and warmer. It will take decades at least before carbon-neutral technologies saturate the market. We had better start now. But emissions reduction is not the only way to keep the impacts of climate change in check. Yesterday’s IPCC report – repeating its prophecies of doom if emissions are not curbed – missed an opportunity to advise policy makers on how to improve lives. It is one of the greatest national energy projects ever undertaken – and viewed by the German government as an export product: the Energiewende – an attempt by a great industrial nation to do away with fossil fuels and (in this case) nuclear power. Let's step back to less ambitious projects: like learning what a fossil is, learning what a fossil fuel is, learning what the carbon concern is and learning that uranium is an element, as is thorium ... and that's different than a fossil. As for Germany's Energiewende stats ... they burn more trees, and (not indicated here) they burn coal more efficiently (also probably natural gas - which is true in the US). 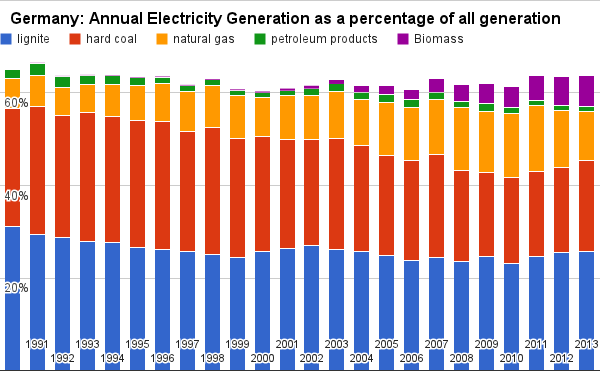 While they burn stuff better, they still get essentially the same share of their electricity from burning stuff (fossil and pre-fossil), as they have for decades . For more than a week in late March, on a recurring base, several major French cities including Paris were swathed in a brownish smog dubbed “particules fines” by the media. That is microparticles emitted by “clean low carbon” diesel-fueled cars, now making up 75% of the French 40-million car fleet and over 85% of new car sales. The reason is ultra simple ­ diesel fuel is subsidized at a lower pump price than gasoline, despite diesel fuel having 10% more energy in every liter compared with gasoline. The apparent higher mileage of diesel-fueled cars is explained by that, but for politicians and the consumer public, especially in France, the diesel car was a miraculous weapon for fighting the catastrophe of global warming. Former president Nicolas Sarkozy and his environment minister Jean-Louis Borloo warmly supported French car fleet dieselization at the 2009 Copenhagen conference. To no avail, public health and environmental associations point out that the UN WHO's Institute of Cancer Research, ironically based in the French city of Lyon went so far, in 2012, as to give a hard-edged estimate for the number of cancer deaths caused by inhaling and ingurgitating diesel fuel residues, of about 200 000 per year for the EU, and 44 000 per year in France. Only cancers linked with cigarette smoking cause a higher annual death toll, according to the UN WHO. But who would take any notice of the WHO when sea levels are rising at seven-tenths of 1 millimetre per year and diesel cars are so cheap to run?